The Philippines has an estimated $840 billion worth of untapped mineral resources, according to the Mines and Geosciences Bureau of the Philippines which is responsible for giving permits to mining companies to do exploration of mining areas and to commence operation. Small-scale mining industries have contributed to national revenues. A big problem ensued with the signing of the Philippine Mining Act of 1995 authored by then Senator Gloria Macapagal Arroyo which allowed 100% ownership of the claimed mining land area and minerals by foreign multinational mining corporations. Large-scale mining is destructive as it uses the method of open-pit mining which entails clearing thousands of hectares of rainforests and agricultural lands, deep excavations to extract minerals, the use of toxic heavy metals and chemicals to process mineral ores, and the consumption of millions of liters of water – all of which negatively impact the lives of the Filipino citizens with the grave disregard for their right to health, life, food security, livelihood, and a clean environment. This is the social justice issue of large-scale mining. Large-scale mining is against the sustainability of the environment and of the people’s cultural identity and quality of life. Corporate mining permits multiplied under the administration of President Benigno Aquino III in the belief that large-scale mining tax revenues would spur economic growth. However, environmentalists blame the liberalized mining sector for the greater destructiveness of natural disasters in the country. According to Marya Salamat of bulatlat.com (2013), environmentalists blame mining companies for contributing to massive siltation of the rivers, poisoning the waterways and agricultural fields with toxic chemicals and rendering communities more vulnerable to flooding. At the same time, local communities affected by mining bewail the loss of their former livelihood in fishing, agriculture and forestry, “as some of them were forced to become mineworkers instead, or service workers for those at work in the mines, including some women becoming prostitutes, reportedly driven to it by the combination of their family’s loss of land, livelihood and influx of men working in the mines” (Salamat, 2013). 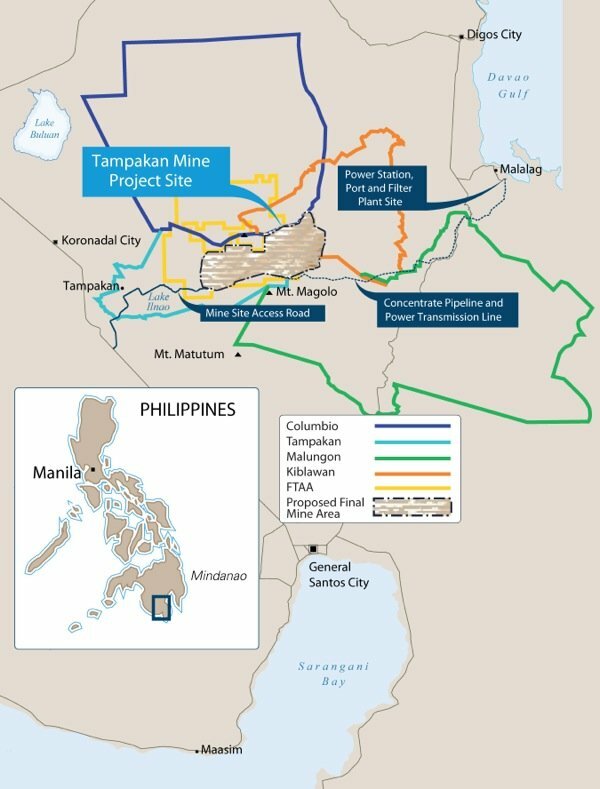 If realized, the proposed Tampacan copper-gold mining project by the Sagitarrius Mining Incorporated in South Cotabato, Mindanao would be the largest open-pit mine in the Philippines and one of the largest of its kind in the world. The open pit would reach an extent of 500 ha and a depth of 785 meters while the topsoil stockpile would cover an area of 5 ha and the pit ore stockpile 49 ha, according to conservation and development consultants like Clive Montgomery Wicks. On February 2013, the Mines and Geosciences Bureau under the Department of Enviroment and Natural Resources issued an Environmental Compliance Certificate to SMI. But various civil society groups and church leaders strongly oppose the Tampacan copper-gold mining project because of its disastrous impact to the environment, to the watershed area spanning three major rivers in Mindanao, to agricultural production, and to the displacement of 5,000 people living in the area where the proposed mining will be done. 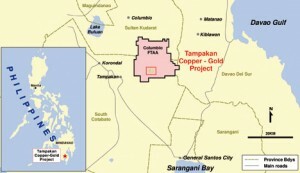 The sad and unfortunate concomitant to the struggle against the Tampacan copper-gold mining project is the lack of in-depth analysis of most mainstream media news on the issue, and instead of providing an assessment of the impacts vis-à-vis the alleged benefits from the mining project, tend to provide news on the corporate affairs of the multinational corporations which have interest on this project. 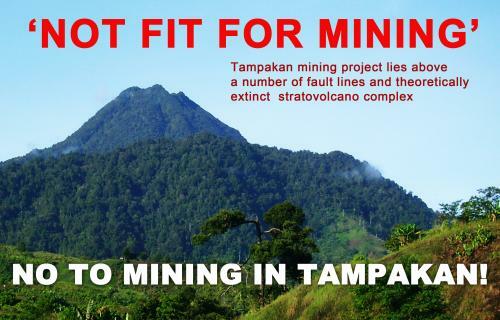 In contrast, alternative media like bulatlat.com and davaotoday.com provide news reports with in-depth analysis of the mining situation and show the alternative viewpoints of those who are against the mining project. In 2012, Bulatlat.com reported on what has not been reported by the mainstream media: the massacre of a B’laan family whose head declared a tribal war against SMI. Davaotoday.com reported on the Catholic Bishops’ plea to President Aquino to stop the Tampacan mining project on strong moral grounds. Civil society groups which are against the Tampacan mining project such as Kalikasan Peoples’ Network for the Environment, Alternative Forum for Research in Mindanao, Center for Environmental Concerns, and international non-profit, cause-oriented organizations such as War on Want, London Mining Network, Banktrack, and Indigenous Peoples’ Link have posted press releases, investigative reports, and analytical articles on the destructive impact of the proposed large-scale mining project and expressed a clear, strong opposition to the proposed mining project. The proposed mining project straddles the jurisdiction of two regions, four provinces, four municipalities, and nine barangays. If this mining project will be realized, its environmental cost and negative impact to the livelihood, health, and quality of life of the Filipinos living in affected areas in four provinces of Mindanao (South Cotabato, Sarangani, Sultan Kudarat, and Davao del Sur) will be immense and incalculable, to say the least. The open pit will not be back filled, and according to Dr. Godilano (2012), the billions of tons of acid forming waste rocks and mine tailings that the mining corporation will leave behind will require management in perpetuity. According to the Catholic Church in South Cotabato, if Sagittarius Mines, Inc. (SMI) will be allowed to operate, it will destroy the environment by massive clearing of 6,935 hectares of rainforests and agricultural lands, contaminate three major watersheds (ridge-rivers-reef) for five provinces, and dry up the irrigation systems in the lowlands and the aquifers in General Santos and Koronadal City. It will result to the dislocation of almost 6,000 surface dwellers, mostly B’laans, from their ancestral land, and has actually led to human rights violations with the killing of anti-mining indigenous people and activists and the restrictions of access by the indigenous people to the forests and agricultural lands claimed by the mining corporations. In addition, it impacts negatively the people’s health, safety, food security and right to life and livelihood by the constant risk of breakage of the dam that will hold the mine tailings and the contamination of water, soil, and air by toxic chemicals and heavy metals that will be used for processing the mineral ores from the mining area in Tampacan. The added risk is that the Tampacan mining area sits on fault lines, which increases the risk of seismic activity that poses threat to the spilling of the dam for mine tailings and the contamination of flood waters with toxic mine wastes due to the deforestation of the area, soil erosion, and siltation of rivers, which further aggravate and are aggravated by climate change. Because of these huge environmental, social, and cultural costs, allowing the SMI to operate tantamounts to a betrayal of the Philippine nation and of the Filipino people because no amount of taxes that will be obtained from SMI can compensate for the environmental destruction and long-term negative impacts on the health, food security, and right to life and livelihood of the Filipinos in five provinces of Mindanao- South Cotabato, Sarangani, Sultan Kudarat, Davao del Sur, and Maguindanao – and the cities of General Santos and Koronadal. The promises made by the mining company to provide scholarships and provide livelihood to the affected people, especially the indigenous B’laan tribe, are mere palliatives in comparison to the massive environmental destruction and long-term negative impacts of this proposed large-scale mining project. The government must listen to the cry of the Filipino people to stop the Tampacan mining project. The Philippine Mining Act of 1995 which allows for 100% ownership of mineral ores and land covered in the claimed mining area should be repealed because it is against national sovereignty and against sustainability of the environment, cultural identity, quality of life, and livelihood of the Filipinos that will be most affected by the large-scale mining projects. President Benigno Aquino should learn to adopt the principles of sustainable development, repudiate neoliberal economics which is pro-corporate profits and breeds grave inequities in the world, and repudiate the impositions of World Bank, World Trade Organization, and International Monetary Fund. Citizens who understand the situation must shout together the protest against the evils of neo-liberal capitalism exemplified by large-scale, corporate mining and must put a stop to the desecration of nature and the violation of human rights of the poor and the indigenous peoples of the Philippines and other developing countries. Professor Belinda Espiritu is the Coordinator of the Mass Communication Program at the University of the Philippines, Cebu.